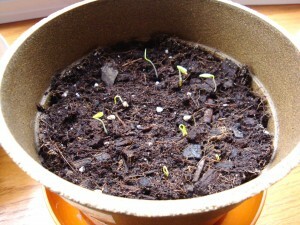 Here we are 10 days after planting and I have lots of little green sprouts peeking out of the soil! There is just something so magical about watching Mother Nature unfurl her little stems and see teensy-tiny leaves open to the waiting sunshine. 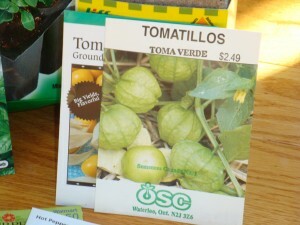 The tomatoes were the first to appear, followed by the tomatillos, then the cilantro. I also have Iceland Poppy seeds breaking the surface and my Parsley isn’t too far behind either. My peppers have not sprouted yet, they are very fickle plants that require a longer germination time and are VERY particular about the air/soil temperature. 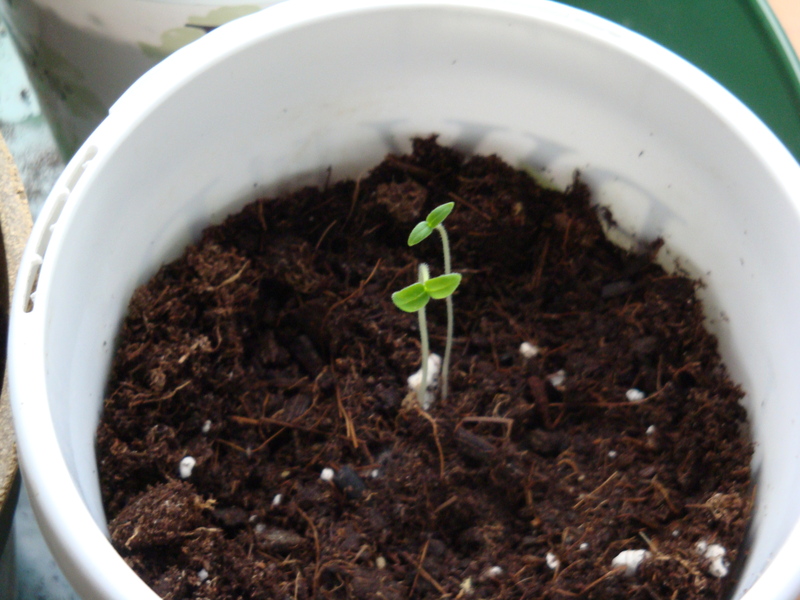 They need to be kept in a 75F to 80F warm place and usually take almost 3 weeks to sprout. Lots of PATIENCE is needed with Pepper Plants! To manage an even temp for them, I keep them downstairs in the family room instead of the living room window as we have a wood stove in this room that is kept going all day and into the evening and then I place them on to a heating pad bed for the night to keep them warm after the fire goes out. This worked out very well last year and I found keeping them on the heating pad nightly for a month after they sprouted allowed for them to grow quickly too. If Pepper plants are kept in too chilly of an environment, this will stunt their growth and make for longer fruit maturation time, and we want to be able to harvest them in July and August – not September! 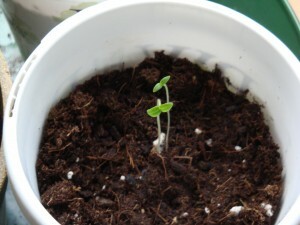 Stay tuned to see the pepper plant sprouts hopefully coming soon! 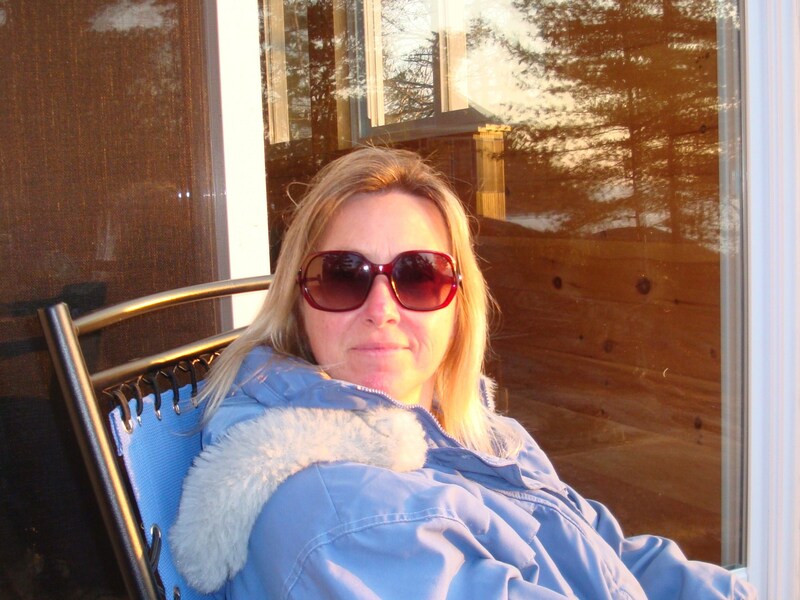 Let me tell you a secret about being a Realtor® (you may actually already know this)…it is a highly stressful job! We, as Realtors®, work long hours having to juggle family and work commitments…we pass our husband/wife in the mornings and they say ‘who are you??? ?’ after we have been out half the night trying to close a deal. So we need creative outlets at times to de-stress ourselves, to save us from the housing chaos that I call our profession….so how do I ‘de-stress’ myself? Who doesn’t love to garden?! 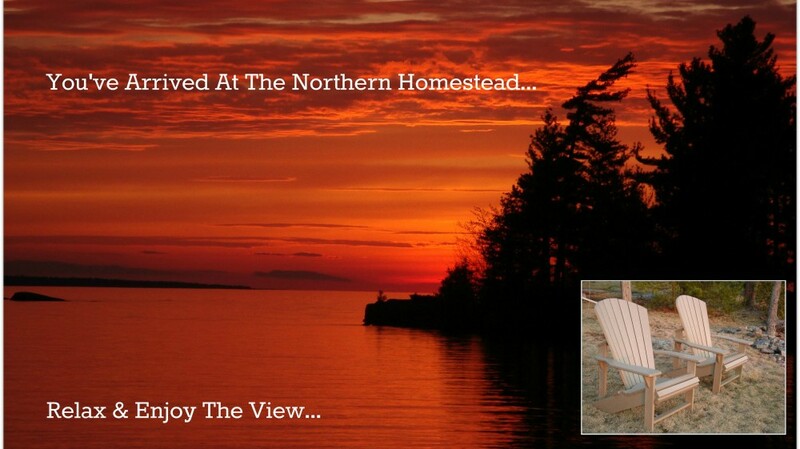 Oh I know there are probably plenty out there that would prefer a concrete jungle…. but not me, I love to get my hands dirty in the warm soil as soon as Mother Nature’s icy grip has left my yard…which incidentally, the way it’s going around these parts, could be next week! We have had an unheard of in AGES mild winter with only a scattering of a few flurries here and there and a few bitter cold days back in early January. But today, the mercury is to climb to 10C (50F) and the sun is a welcome ray of warmth on the still green grass of my front lawn…even the birds are confused, I think I witnessed some nest-twig gathering by a pair of sparrows…or perhaps they were just jousting with them…in any event, the birds are happy with the warm spell and so am I! But every year, I have had to re-think what to plant in the plot in front of the pool shed… it is a raised bed with very good drainage due to the excess crusher-run stone that has migrated out from under the concrete pool deck (with the help of tunneling chipmunks and lets not forget the skunk invasion a few years ago, she excavated a wheelbarrow full in 10 seconds flat) and has mixed well with the soil to produce a superbly draining flower bed with full sun. Now with that full sun, comes a price of having to water the dang thing daily or your cute, cheery annuals are soon wilted and scorching under the blazing sun. I have tried ‘Sunpatiens’ (that turned out to not be so sun-loving), next it was ‘Easy-Wave’ Petunia’s (they soon waved bye-bye under the heat), and then it was on to Verbena and Coleus, which actually fared a bit better and would tolerate a missed day or two of watering before they too, succumbed to the sun’s scorching rays…sigh, I hated to see all that hard work and money spent on flowers only to see them keel over. So during the winter of 2010/2011… I was searching on-line and through numerous gardening books looking for a plant(s) that could handle the well-drained soil and the killer sunshine….and then it dawned on me… Why not grow VEGETABLES?! It had never occurred to me to grow veggies before, I always thought of my garden as just a ’Flower Garden’. Now pretty much from what I have seen out on the local farmer’s fields, every vegetable that is grown for human consumption requires boatloads of sunshine! and boatloads of sun I had! Well with that lightning bolt jarring me, I set to work deciding just WHAT kind of veggies to plant…what did I like, hmmmm….well tomatoes for one, I can (and do) eat tomatoes everyday, in some form or another, and being the lover of Mexican cuisine, peppers just had to be added to the mix too…all kinds of peppers! and herbs! Let’s not forget the benefits of fresh herbs! I had just come back from a trip to Mexico last February and while there, I had taken a one day cooking class at ‘The Little Mexican Cooking School‘ located in Puerto Morelos in the Mayan Riviera and came home with a booklet of Mexican recipes. In this booklet are 4-5 salsa recipes that would be perfect to utilize my fresh, home-grown tomatoes and peppers. 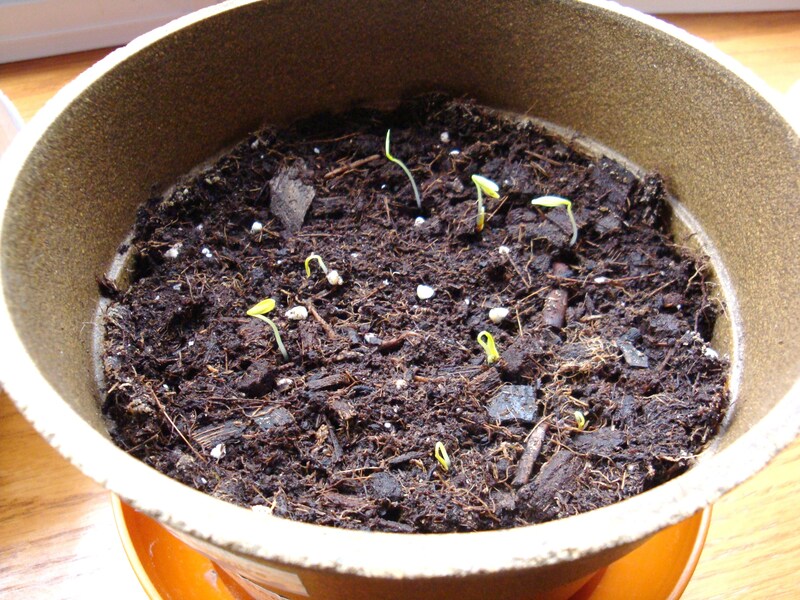 So by mid-February, I had my large, sunny, living room window full of little peat pots containing Cherry Tomatoes, Jalapeño Peppers, Poblano Peppers, Serrano Peppers, Anaheim Peppers and Bell Peppers, I also planted Basil, Chives, Parsley and Cilantro. What fun it was to watch those cute little sprouts spring up through the soil in March and April and then set my lovely little seedlings in the killer garden patch in mid-May. Well, the end result…. this was the BEST idea I have had in our 15 years of living in our current home! My vegetable garden not only flourished, but produced a TON of produce! Note to self though, you do NOT need 6 cherry tomato plants for one person! (my hubby does not like tomatoes)…man, I was giving them away by the bucket load during July and August. 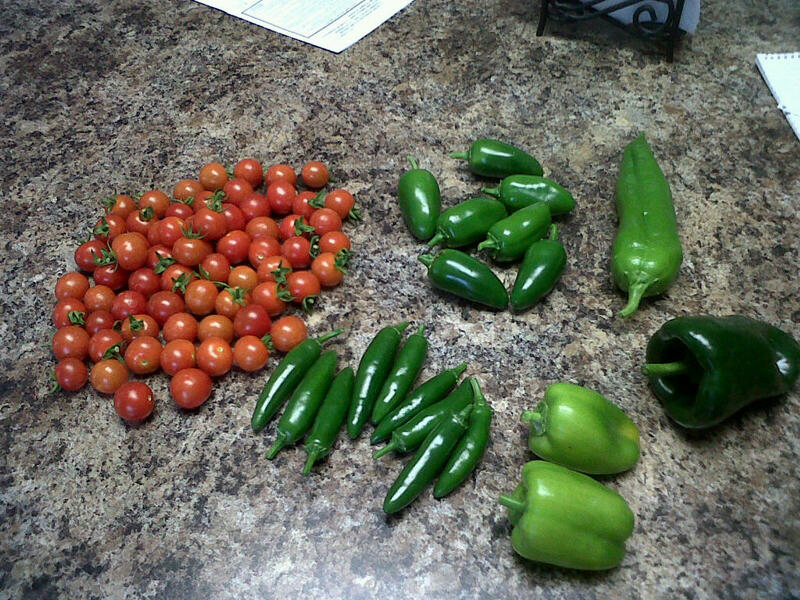 Come September, I was pickling peppers, making fresh pico de gallo and guacamole’s, roasting and freezing peppers and canning salsas and sauces! But best of all ~ not ONE of my plants keeled over from the scorching heat! 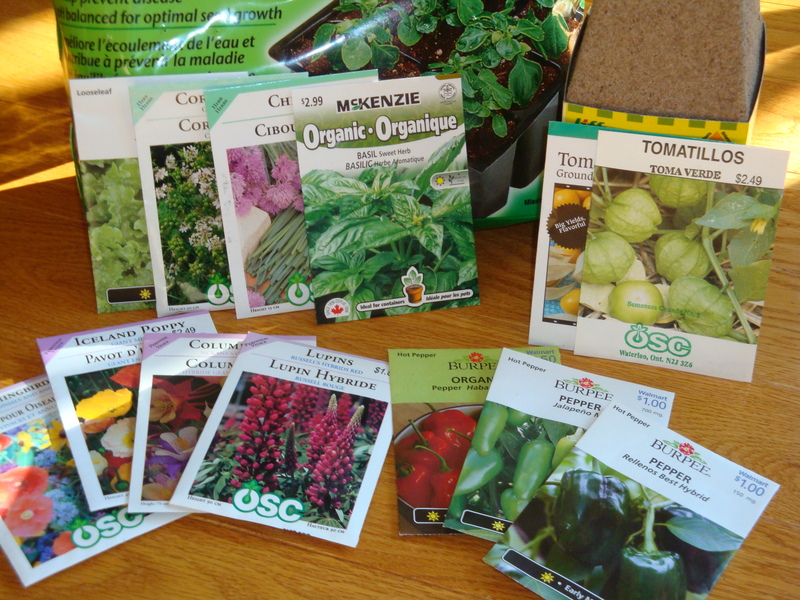 It is now that time of year again, I just got back from the garden centre with a new armload of seed packets and peat pots…. I am just itching to get back into the garden and this year I will have double the space! Last fall we were lucky enough to purchase a cottage in Northern Ontario and there is more than AMPLE garden space there (and my very own resident wild blueberry patch!) so half of what seeds I start here will be transported and planted once the ground warms up enough there. Along with the veggies, I will be starting some perennials and annuals that are Hummingbird favorites for the cottage as there are quite a few hummers that are regulars to our feeder, so to minimize their fighting (they are notorious, selfish little critters that do not share well), they will have some wildflowers to feed off of as well. Here is what is on the agenda for growing this year; Tomatoes (Cherry and a ‘Tom’ variety), Poblano Peppers, Serrano Peppers, Jalapeño Peppers, Habañero Peppers (can you tell I like peppers?) a variety of Herbs, Leaf Lettuce AND…. Oh I am so excited…drum roll please! They finally have Tomatillo seeds available here in Canada! I was totally gobsmacked, about time someone brought the green wonders across the border! So here I am…anxious to try my hand at growing my own this year. Wish me luck!